Recorded in several spelings as shown below, this is one of the oldest of English surnames. Originally in ancient times it was a personal name of endearment as in "Little man," and even as a medieval nickname surname, probably did not describe a man of small stature, but the very opposite. This is proven to a large extent by the famous outlaw of Robin Hood fables "Little John," so called because he was a giant of a man. His long bow supposedly seven feet in length, was for many years was to be found at the famous Bolton Arms, at Bolton Abbey, in Wharfedale, Yorkshire. It is also claimed that word was used for the younger of two bearers of the same name, as in the modern and mainly American practice of using "junior" for a son with the same name as the father. Early examples of the surname taken from surviving registers include Lefstan Litle in Feudal Documents of the Danelaw at the abbey of Bury St. Edmunds in the county of Suffolk, whilst Thomas Lytle was recorded in Sussex in the Subsidy Tax rolls of 1296. John and Jane Little were early emigrants to the English colonies of the New World being recorded in the parish of Christchurch, Barbadoes, in 1678. 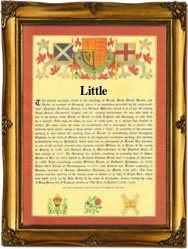 Modern spellings of the surname include Little, Littell, Lytle and Lyttle. The first recorded spelling of the family name is shown to be that of Eadric Little. This was dated 972, in the register of Old English Bynames, for the county of Northamptonshire, during the reign of King Edgar, 959 - 975 a.d. Surnames became necessary when governments introduced personal taxation. In England this was sometimes known as Poll Tax. Throughout the centuries, surnames in every country have continued to "develop" often leading to astonishing variants of the original spelling.